Renthal half-waffle dual-compound Kevlar grips are among the best MX grips on the market. Renthal has developed a special compound for its grips using Kevlar. As a result, the grips are extra-strong, able to withstand significantly more wear than Renthal's other grips without sacrificing comfort or control. Another great feature of these Renthal Kevlar grips is the half-waffle design. The half-waffle construction is prevalent among MX grips because it caters to both comfort (smooth on the palms) and control (waffle on the fingers). Renthal has developed a special Kevlar reinforced grip, with all the properties you would expect from a Renthal grip along with the added life-extending properties of Kevlar. The grip's base material is reinforced with millions of randomly aligned Kevlar fibers. As the grip is used, more Kevlar fibers are exposed, so the percentage of Kevlar at the grip surface increases. The grip's Kevlar layer offers three times the life of the regular compound, which allows Renthal to use a very supple matrix material. This revolutionary material lasts three times as long as Renthal's regular soft material. These Renthal grips are for use with twist throttles. If you use glue on the installation of Renthal grips, due to the specific compound, only Renthal grip glue will work. Grips are great! great value from RMATV. Color goes with any dirt bike decor. Easy installation. Great feel. These are the only grips I'll ever buy. Extremely durable and comfortable. And also look way cooler than basic black grips. They also clean off easily to keep them looking fresh. Best grip on the market. Good durability and perfect comfort. These are my personal favorite, tacky and last. These grips provide excellent grip while being very soft with that being said they don't last as long as I'd like but there has to be a trade off. This grip is still my favorite though. Bought my 3rd set of these now and they’re well worth the money. Hold up very well, especially for bikes without bark busters or bar ends. Super comfy grips and the color is pretty cool. 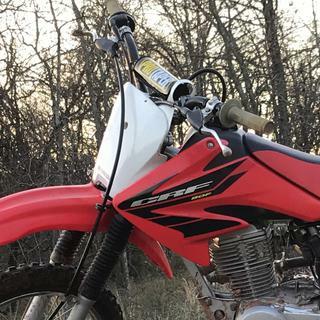 Worked very well for both sets I put on my xr650l supermoto (note that these won’t hold up well if you lowside on a road course and you’re not running bar ends) and are working equally as well on my crf80f. Well of this product. Also helps with arm pump and gives a really good grip and lasts for a long time. Great grips! Definitely worth the extra money! Best grips out there for sure. Lasts much longer than anything else. These grips are awesome easy to install, feel great, and the tan color blends in with all colors! I’ve tried many different grips for MX. The Renthal kevlar are by far my favorite. Perfect size and they last forever. Easy to install. More comfortable and longer lasting than other grips. Excellent!!! great grip the Kevlar dual compound last forever soft. Just a great grip! Best grips I will highly recommend them. Worst grip I ever owned, tip over once and they tear up like a wet paper bag. The feel is very nice but they just don't last. I have tried ever grip out there this is the best hands down once you use these grips you will never use anything else! Very durable. I have two bikes and they withstand a lot of impacts due to ground contact from falling over and or wrecking. I highly recommend buying the Renthal grip glue! It is the only way to get the grips to stay in place. Hand down the best grip ever. been using the kevlar grips since they came out over 15 years ago! They are the only grip i know of that can survive a good tumble. feel just as good as the ultra tacky grips, but last 3 times as long. if you can get over the color they are awesome grips. Best grips I've put on a bike in 29 years. Fantastic feel and soft feel. Huge fan of the half waffle that's been around forever. These are my favorite grips I've tried! They feel normal sized and offer great cushion. They seem to resist tearing on crashes much better than other grips. Super comfortable and reduces vibration. These grips have been the best I've tried. I've used soft, mid and hard compound half waffles and I also recently tried the dual compound half waffles. These kevlars are very tacky and provide excellent grip. They don't wear out nearly as fast as a soft compound and they hold up to some solid spills. Very pleased. Best grips on the planet. Super sticky, super resilient. Have some on bikes. Won't ever buy another grip. Renthal is the clear choice for value and durability in any Control application. Not to mention they always look Awesome! Hold up great, plenty sticky, cut out a bit of vibration too. I replaced the same grips after the wires were twice as tall as the grip they were so worn..... Renthal may boast a bit too much as to the life and durability but it is still pretty good. I really like the feel of these grips, but they haven't held up any better than regular grips. these grips are amazing in comfort and wear. ive had these grips on my bike for about 4 years now and ive ridden almost everyday in those 4 years they are still on there they are very worn but they are still gong i am very surprised how long they have lasted and the comfort of them they are super grippy and soft. to these grips there are 2 layers to them and the first layer is soft grippy and squishy the second layer is still kinda soft but thats your last long layer. on these grips on my bike the whole first layer has worn off and is down to the second layer and still holding up and feeling good somehow. 10/10 5/5 what ever buy them cause they are amazing i would recommend them to any one who rides. I generally buy full diamonds and most pairs last until the texture is completely worn off so the supposed extended life isn't really a selling point for me. I actually bought a set just to get the free shipping and simple curiosity. I cut off the waffles with a razor blade and installed the grips using just safety wire like I always do (no glue) and these grips have always moved a little after a day at the track. Not a big deal. What is though is the fact that both grips have torn through the end caps without what I would consider reasonable causes. The left grip has punched through the end cap from the very minimal movement causing slight inward pressure on the grip and the right hand side is tearing where the Kevlar compound meets up with the end cap. Granted this damage is likely due to my not using the specific grip glue they recommend, but I haven't had any issues with other Renthals or any others grips. As for me I will stick with their standard offerings in the future. These grips do however have a pretty nice feel as far as the compound goes and they have lasted around 15 - 20 hours even with the improper installation..
Love these grips! Very tacky and feel great!! I'm on my 4th pair!! Best grips I've ever used. This have great grip while being really tough. You will get tired of looking at these grips before they wear out. OK, last longer than cheaper grips. Syckk. Great grips. All I use. are these thicker than a traditional grip? BEST ANSWER: No they are not any thicker than normal half waffle grips. What I like about them is they wear in to the shape of your hands which make them very comfortable. And if the look of that wear doesn't bother you they offer a long service life. No, they are the same size as the regular Renthal half waffle grips. The material is just different. They are tacky, and the most durable grips I've ever used. Well worth the extra money! No, Not really. They are pretty strong and comfortable and work well. They will not take a bad get off if you drive them into the ground on a crash in rocky or hard terrain. 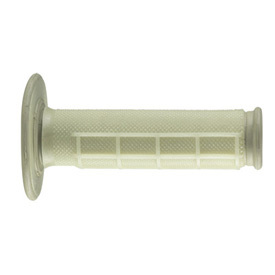 Same size as the standard renthal grips, Kevlar makes them more resistant from tearing/wear. In between soft/med compound feel. Not really, I love them, they wear well and are very comfortable! I have to dremel out the ends because i have Enduro Engineering bark busters. Will these give me a problem because of the Kevlar ? BEST ANSWER: No, in my experience these grips cut just like normal grips. I have used these grips since they were introduced years ago, always with bark busters. No. Not at all. The ends can be cut just like a regular grip. I use a utility blade with no problems. No, you will not have any issue at all.